Playing an 8-bit video game on an 85,360-square-foot monitor in front of an entire city – perhaps the dream of anyone who grew up during the golden age of the arcade in the 1970s and ’80s – is becoming reality with help from a professor in Drexel’s College of Engineering. The screen: Brandywine Realty Trust’s 29-story Cira Centre Philadelphia office building. The visionary: Dr. Frank Lee, co-founder and co-director of the Drexel Game Design Program. On April 19 and April 24 Philadelphians young and old will have the chance to grab the arcade-style joystick one more time and engage in that timeless quest to spin the bouncing ball past the opponent’s paddle – writ large on the 437-foot north wall of one of the iconic buildings of Philadelphia’s skyline. More than 400 of the 1,514 LEDs affixed to Cira Centre’s shadowbox spandrels will recreate the game’s classic pixilation as competitors will go elbow-to-elbow from a vantage point across the Schuylkill River on the steps of the Philadelphia Museum of Art. 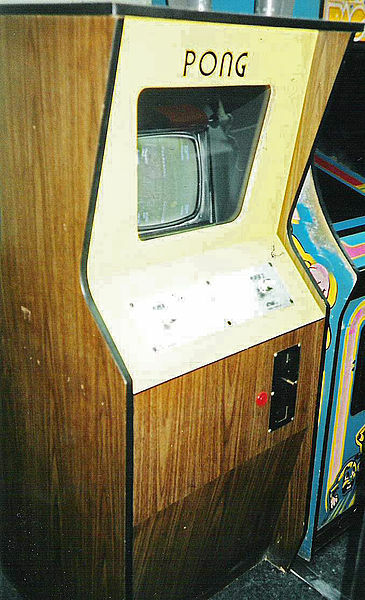 In-cabinet version of classic, arcade Pong game, circa 1980. A night time view of the northeast side of Brandywine Realty Trust’s Cira Centre in Philadelphia. Turning an entire city into a vintage game room to kick of the third-annual Philly Tech Week is an undertaking that Lee has been thinking about for quite some time. But realizing his dream took quite a bit more work than sliding a quarter in a slot at the arcade. Since then, Lee has been steadily working to have others adopt his vision, including the President and CEO of Brandywine Realty Trust, Gerard H. Sweeney, who gave Lee the go-ahead in late January to turn his building into a video game. Christopher Wink and Brian Kirk, co-founders of Technically Philly and Philly Tech Week, shared Lee’s excitement at the prospect of reliving their childhood gaming experience while sending a message of inspiration to the city’s tech community and decided to make it the showcase event of Philly Tech Week 2013. Lee, whose gaming program at Drexel was recently ranked No. 6 in undergraduate and No. 3 in graduate in the nation by Princeton Review, and his Drexel colleagues Marc Barrowclift and Gaylord Holder wrote the software to turn the video game into a giant light display on the building. And on March 15, Barrowclift and Holder connected their computer to the laptop in Cira’s modest basement control center for the first trial run. A second test in late March gave Lee a chance to see the lights at night and have some fun with a couple of his other favorite classic games, Space Invaders and Pong, on the building’s light array that will become a 20×23 grid of giant pixels. When the digital curtain rises on Lee’s grand extravaganza on April 19 the professor will be living out his dream, but he’ll also be helping to inspire a new generation of dreamers. “The video game industry is nearly a $70 billion enterprise globally and growing, especially in this region. I hope this project will help people look at gaming in a more positive light, as a way to bring people together both young and old. I especially want this to encourage kids to follow their dreams wherever they may lead, whether it is making the world’s biggest videogame or anything else,” Lee said. For media requests regarding the event contact Britt Faulstick at bef29@drexel.edu or 215-895-2617.